but He loves me when I sing." Simon will not be running a new Sound Healing Practitioner Training Course this year or in 2018. For all College of Sound Healing Practitioner Training Courses please visit the College of Sound Healing website. The Sound Healing Practitioner Training is run through the College of Sound Healing. For full course information please go to the Course Curriculum page. 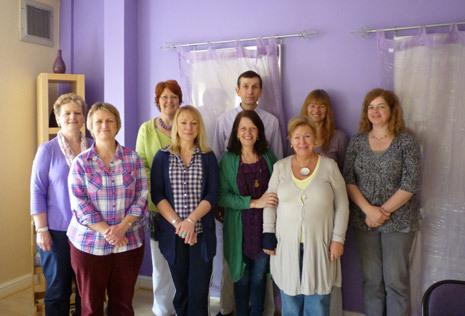 The Sound Healing Practitioner Training comprises five weekend workshops taken over a year and a half. The five parts of the course should be taken in order. The cost per weekend is £185. This cost does not including accommodation. Students will also need to complete two additional Sound Healing Workshops during the time that they are training. Details of the these workshops can be found on the College of Sound Healing web site. FINDING YOUR VOICE - Our voice is our greatest gift for healing ourselves and for healing other people. For many of us our voice becomes blocked because of painful experiences in childhood. If we are told at school that we can't sing we become self-conscious about our voice and loose our self-confidence when singing. LISTENING - If our parents continually shout at us when we are children we may block out the sound frequencies in their voices. When certain frequencies become blocked in our hearing this effects our voice and our ability to sing in tune. This also effects the functioning of our body. In the workshop you will learn how to reawaken your hearing and reconnect with your true voice. The voice is often called 'the muscle of the soul'. When we find our voice again we reconnect with our joy, power and beauty. SOUNDING - Toning long vowel sounds has a healing effect on the body and mind. Toning with other people is simple and fun to do. Learn how to use sound for healing blocked emotions. BREATH - Learn how to breathe correctly for toning and overtoning. HARMONICS - Experience the amazing world of harmonics and overtones. Learn how to create vocal harmonics. Creating vocal harmonics will take you into sates of deep peace and inner stillness. CHANT - Have fun learning and singing some simple sacred chants from around the world. CHAKRAS - Balance your chakras with a sound healing meditation. SOUND HEALING SESSION - Experience a sound healing session and a sound bath where everyone sends healing sound to one person. PRINCIPLES - Understand the principles of sound healing. Learn how sound healing works and why it is so effective. DIAGNOSIS - Learn how to make a sound healing diagnosis by scanning a person's body with your voice. SOUND HEALING TREATMENT - Experience a sound healing session. Learn how to give a sound healing treatment and receive one yourself. EMOTIONS / PAIN - Learn how sound healing can be used to treat physical and emotional pain. SOUND BATH - Receive a sound bath where one person receives sound healing from the whole group. SILENCE - All sounds arise out of silence and return to it. Learn how to find silence within yourself. Understand the importance of silence in a sound healing session and in your life. 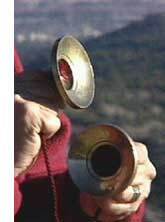 TUNING FORKS - Learn how to use tuning forks in a sound healing session. MUSIC - Learn why music effects us so deeply. Experience the effect of different types of music on your body, mind and emotions. Understand the effects of harmony, rhythm and pitch. MUSICAL INTERVALS - Learn what musical intervals are and how they effect us. Experience the healing power of musical intervals in a sound meditation. Learn how you would use musical intervals in a sound healing session. HEALING PROCESS - Deepen your understanding of the healing process. Learn what happens in a sound healing treatment and what occurs after a session. Learn how to avoid picking up a client's negative energy. Find out how to become a clearer channel for healing. INDIAN SCALE - Learn how the sounds of the Indian Scale can be used to balance your chakras. Learn how these sounds can be used in a sound healing session. CHAKRAS - Learn about the chakras? Learn what causes imbalances in the chakras and how these can be healed? SANSKRIT SOUNDS - Learn about the five elements and the Sanskrit 'bija' (seed) mantras connected with each element. Learn how to sound these mantras correctly. Learn how to use these sounds to balance your chakras in a sound healing meditation. Learn how to use the 'bija' mantras for the five elements in a sound healing treatment. Give and receive a sound healing using the Sanskrit sound of the chakras. COLOUR - Learn how sound healing can be combined with colour visualisation. COURSE REVIEW - Review the sound healing practices you have learnt on the course. NEW PRACTICES - Using Sound to Release Pain / Using Percussive Sounds in a Treatment / Distant Healing with Sound / Sounding with Your Client. PREREQUISITES - It is helpful if participants have had some experience of healing or voice work before attending the course. PRACTICAL ASSESSMENT - There will be a practical evaluation in which students will give a supervised sound healing treatment to another person on the course. PRACTICE TREATMENTS - A total of thirty six practice treatments need to completed. Twelve treatments studies need to be completed after parts two, three and four of the course. The thirty six practice treatments can include up to three treatments on one person. The thirty six practice treatments will need to be written up and handed in to complete the course. WRITTEN WORK - Two pieces of written work of approximately 600 words each will need to be completed by students after each part of the course. Students will also need to complete a 3,000 word essay. TIME - The course will involve 70 hours of attendance plus two additional workshops. Students will need to spend approximately 36 hours completing their case studies, 18 hours writing up case studies and 20 hours for their written work. Total hours in first year - 144. PAYMENT - The cost for each weekend workshop is £185. This is paid on the first day of the each workshop. To reserve a place on each workshop a £50 deposit should be paid to the course tutor in advance. The £185 does not include accommodation or course materials. COURSE MATERIALS - Students will need to purchase a set of Biosonic tuning forks (£46 plus £2.50 postage for the Body Tuners). The course book 'Sound Healing Practice' is provided free of charge to students. CERTIFICATE - At the end of the five weekends of the course if students have satisfactorily completed the case studies, written work and sound healing evaluation, the College will present them with their certificate of competence. Once students have completed two additional Sound Healing Workshops they will be able to become members of the College of Sound Healing and use the initials MCSH. COLLEGE MEMBERSHIP - Student Membership of the College costs £30 for two years. Full Membership of the College of Sound Healing costs £40 per year. INSURANCE COVER - Students will need to have insurance cover while they are training. Insurance for Student Members is £35.00 per annum. BOOKING - To book your place on the course, please contact Simon on 01242 230 904. I think the most important thing I got out of the course was to learn that I have an innate ability to heal. There was a lot of encouragement on the course to feel rooted and confident about ones healing gifts. Through the practice sessions, the course helped me to realise that I really love healing work, and find it a very rewarding and uplifting part of my life. The course also helped me to see that healing work can be deeply rooting for myself as well as the one being healed. Most of all, it was a wonderful joy to share with other people in the realisation that sound and one's own voice could be used for healing in such a therapeutic way. It was a real wonder to learn about the voice as a sacred tool for healing. It has given me so much strength to learn how to direct and focus the voice for healing, and to use it as a fine precision tool for imbalances in the body and etheric bodies. I felt on the course, and still feel, that we were asked to trust the practice of Sound Healing. It still amazes me, that such a simple thing of sounding over the body can bring such deep relaxation and healing to people. I needed to trust my instincts and focus on the unseen, what I could hear rather than see. The session work we did has really helped me to be more present with others and focused on the healing process. I am still working on trusting my instincts in each treatment I do. I really enjoyed doing the case studies at home. Although at first it was a bit daunting, by part four I felt very confident while doing the treatments. I felt that the treatments were very rewarding. Not only did they give the client a lot of extra energy, but I found that I was receiving a boost of energy each time I did a session. I noticed that after a treatment on a client, I would generally feel really well, as if I had just had a treatment for myself. It seemed like a win win situation. The chanting that we learned on the course has been really great for me. Working with the Chakra Chanting CD has improved my health, and kick started me on the road to cleansing my chakras. It has also cleared and strengthened my singing voice. I think it has taught me to trust my own singing voice, as a powerful bringer of light and healing. The course has reviewed my whole outlook on music and singing. To me music seems enshrined in beneficence. I can't help approaching it now as an art form of sacred giving and healing. I feel more strongly now how it transcends barriers, and acts as a beacon of love. These feelings about music have really developed and strengthened in me since doing the Sound Healing course. The harmony and music theory part of the course was also an eye opener. I got more understanding of harmony in this course than all my music theory classes at school put together. I found this part of the course fascinating, and really think that the work we did on intervals, cymatics and harmony should all be part of the basic principles of Music Theory in schools. I would love to do more work on these subjects as an extra module. I felt really supported during the course. The course encouraged us to feel that everyone can sing, and that each person's voice is unique and has its own beauty and strength. I felt that the course created a very loving environment to learn in. Everyone was welcome, and I liked the way we were assessed at each term. I liked the way that the course was structured. There was a lot of time to explore the subjects we had worked on at each workshop, and the work was easy to fit in with ones normal working life. The setting was lovely, and everyone was really welcoming. I feel the course has helped me to strengthen and re-energise the spiritual aspect of my life. I feel it has grounded me a lot, and given me more direction and clarity in furthering and developing my capabilities in the healing arts. I am glad that there is a firm group of people supporting the College, and having a Sound Healing Conference each year is a great idea for would be Sound Healers to keep in the loop. Sound Healing, I think, is a fascinating subject to learn. I feel that it is just the beginning of a therapy with much to give. There seems to be a lot more that we can learn in Sound Healing, perhaps not just as a therapy, but its role in society at large. I am really interested in the work people are doing with Sound Healing in schools and hospitals. I think that with more scientific research into the subject, and people's intuitive guidance in music and sound, we will see Sound Healing developing and gaining in popularity in the community at large.